U.S. Sen. Jeff Merkley says people can despair — or take hope — from recent disclosures that officials within Donald Trump's own administration have tried to thwart or curb presidential conduct the officials consider reckless. The Oregon Democrat, at the Friday Forum of the City Club of Portland, said he hopes the disclosures will prompt the public to act as early as the Nov. 6 elections. Trump isn't on the ballot, but Republican control of both chambers of Congress is at stake. "I think we have a choice right now between despair — curl up on our couches and hope when we get off the couch, something will be better — or to be fully engaged," he said. "I am aiming at full engagement." 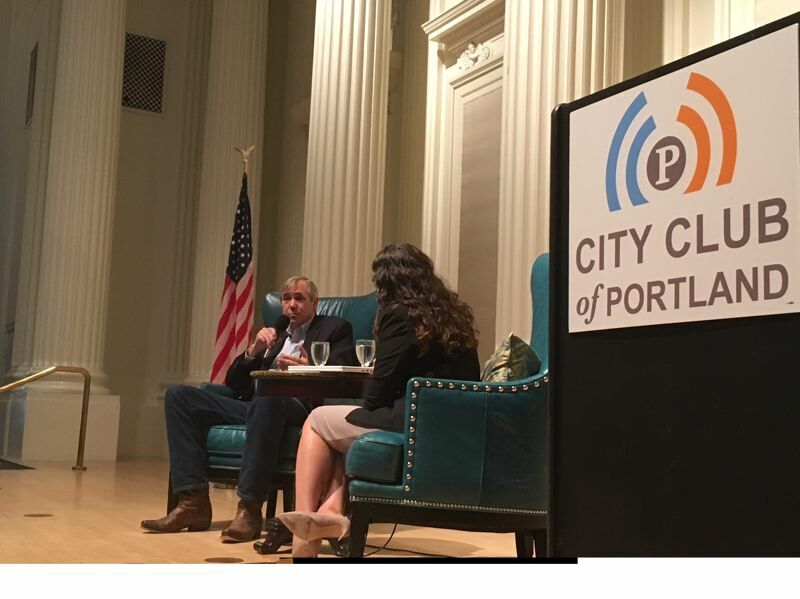 However, Merkley reacted with only the trace of a grin when the moderator — Marissa Madrigal, Multnomah County's chief operating officer and a City Club board member — noted Merkley's travels to the first caucus and primary states in the 2020 presidential election. "Including Iowa and New Hampshire, which delights me," Madrigal said. The latest disclosures came from advance excerpts of Bob Woodward's new book, "Fear: Trump in the White House," and from an anonymous essay by a "senior administration official" in The New York Times. But Merkley said they only reinforce what Trump has said and how he acts. "These are pretty dark times," Merkley said. "We have a president who has adopted the role of divider in chief… it seems like every group you could think of. That is the opposite of the way this country should be led." Woodward's book mentions an intervention by Jim Mattis, a retired Marine general who is secretary of defense. Merkley voted against a legal waiver that made it possible for Mattis to serve in the civilian position — the normal waiting period is seven years — but Merkley then voted to confirm Mattis. "The fact is that we have a president who is attacking our allies… and cozying up to dictators around the world," said Merkley, who once worked at the Defense Department. "So we are in unprecedented and strange times. So we need people like General Mattis." Merkley said Democrats and Republicans — but not Trump — are united on thwarting new efforts by Russia to disrupt the 2018 elections after U.S. intelligence agencies concluded that Russians did so on a large scale in 2016. "The more division the Russians can drive — which unfortunately parallels very well with what candidate Trump's strategy was in 2016 — they are going to keep at it," he said. "We have to have a fierce watchdog that says if you mess around with us, there are profoundly huge consequences. But we don't have that in the Oval Office right now." Merkley said Senate committee hearings on Trump's nomination of Brett Kavanaugh to the U.S. Supreme Court only confirm his negative view of the federal appeals court judge, whose previous service was in George W. Bush's White House. "He has found in his decisions every opportunity to always find for the powerful over the less powerful," Merkley said. "I am absolutely concerned that he represents the corrupting of our Constitution from the 'we the people' vision to government by and for the powerful." But with no filibuster available to minority Democrats to block it, Kavanaugh's nomination appears headed for approval by the Republican majority. Merkley drew national attention June 3, when officials denied him entry into a detention center in Brownsville, Texas, where children were separated from their undocumented immigrant parents. The public outcry led Trump to reverse that policy, though officials now seek to allow indefinite detention of children with parents, contrary to a 2015 court order that the government agreed to for a 20-day maximum for children. Merkley's failed bid in Brownsville followed a visit to McAllen, Texas, where 1,500 children were held in a facility intended for only 300. "These are kids escaping trauma abroad, going through trauma getting into the United States, traumatized — and then traumatized by being taken away from their parents," he said. Merkley said what he did in Texas was similar to trips he organized in November 2017 in Myanmar — where the Buddhist majority forced an estimated 500,000 from the Rohingya (Muslim) minority to flee into neighboring Bangladesh — and in April to five African nations endangered by famine. Merkley sits on the Foreign Relations Committee and its panels on East Asia and Africa. Noting that Hispanics, Muslims and Africans have been singled out by Trump, Merkley called for a different tone. "Let's reach out to those people in our community with those backgrounds and say we stand with you shoulder to shoulder and side by side," he said. "We are all Americans and we are going to go together in unity." Though Sen. Jeff Merkley said he is confident Democrats will win a majority in the House, where they need to switch about two dozen seats, the Senate "is a pretty tall order." Of the 35 seats up Nov. 6 — a couple in special elections — Democrats must hold all of their 25 seats and wrest two away from Republicans. Democrats have fielded strong candidates for Republican-held seats in Arizona, Nevada and Tennessee. But 10 Democratic incumbents are running in states carried by Republican Donald Trump in 2016. Still, Merkley said at the Friday Forum of the City Club of Portland, 10 races are close. "There is great uncertainty," said Merkley, who is part of the Senate Democratic leadership team. "It could go any which way." The current Senate balance is 51-49, counting two independents who vote with Democrats. Oregon does not figure into the mix of congressional politics this year. Neither Senate seat is up, and the four Democrats and one Republican in the House are favored to win new terms. Asked by a student from David Douglas High School — his alma mater, where he was student body president in the 1970s — how people should take part in politics this year, Merkley replied: "Is everybody going to vote?" He did encourage students to work for candidates and causes they believe in, even if they are still under the voting age of 18.